So I worked until 7pm today and I felt pretty exhausted when I got home. But I'm a very lucky girl! Todd had homemade grilled chicken caesar salad all ready to go, just waiting for me to come home to eat it. I'm more than lucky, I'm blessed. What a guy. :-) Oh and this recipe was one of 19 recipes that we included in the recipe book that we made as a Christmas gift to family/friends. 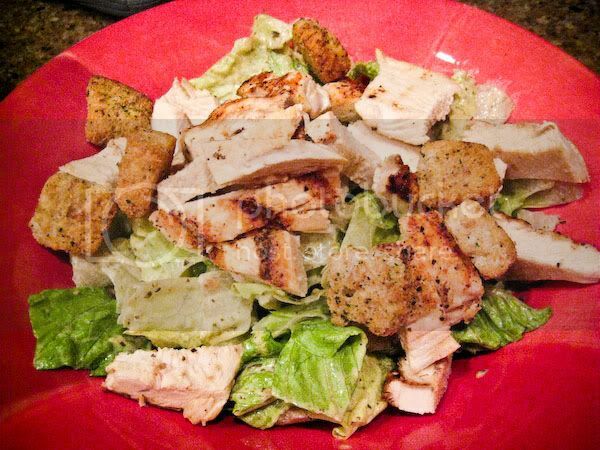 It's called Pesto Caesar Salad. We added the grilled chicken to it. Ever since Peppermint started selling her stuffs at Catscrap in mid-January, she's just been cranking out the products. What a slave driver! :p And all her designs are so awesome and very high quality, so I can't resist scrapping with them. Especially today's new release! I think it's my favorite One Little Bird/Peppermint kit yet! When she showed me her drawing of the robot, I screamed in delight over the intertoobs at her. Here's my layout with it. 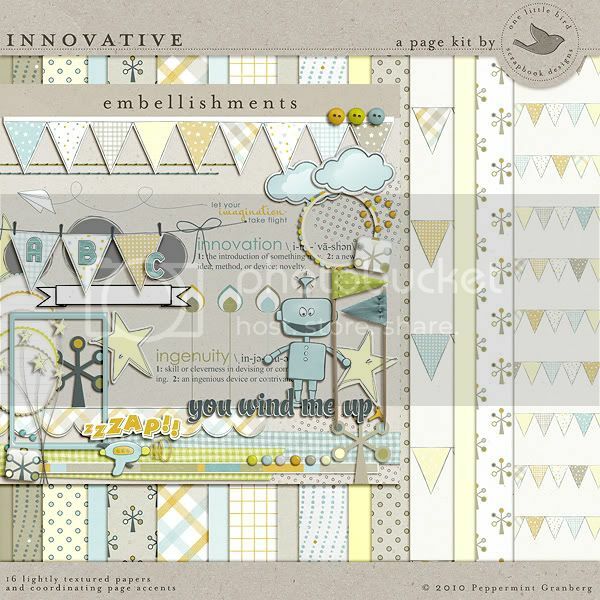 Innovative page kit by One Little Bird @ Catscrap. Template Set #7: Borderific by me @ Little Dreamer Designs. I'm fortunate enough to have been asked to be on my friend Ami Collofello's creative team a few weeks ago. She was one of my favorite designers when I was on the Pixel Gypsy Designs creative team. She is now selling at Polka Dot Plum and The Digichick under the name Dysfunctional Design. I made a page about cupcake love! 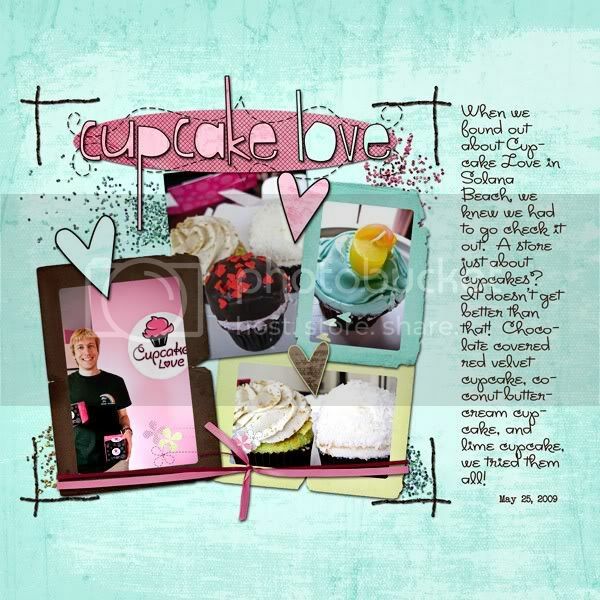 I Love Cupcakes page kit and I Love Cupcakes Alpha by Dysfunctional Designs @ The Digichick. Tomorrow is a very special day. Come back and see why. It is such beautiful colors in the innovative kit, almost feels like late winter/beginning of spring. And the robot is just too cute. Love your LO with the kit, just a perfect match! Love everything about this post..the food, the new Peppermint & Dysfunctional kit, and your little cliffhanger ending. Can't believe you are posting cliffhangers the same week as the LOST premiere...I don't think I can take anymore suspense. You know, there's something to be said for watching TV shows on DVD...I can choose when to stop and NO commercials! But, I digress...I'll be back later to see what's going on with you. Wow, I need to get some more money so I can start picking up some Peppermint kits! 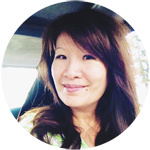 So glad to share a creative team with you again, Christine! Hey Christine... I was just wondering if Peppermint was going to put together a creative team. You are doing an awesome job with her kits and I AM LOVING them!!! I dont know how to contact her or if she was even thinking about it... Or maybe her store already has one for her but I would be honored to be on one for her. Thanks for your time!! Okay, now I want a cupcake.